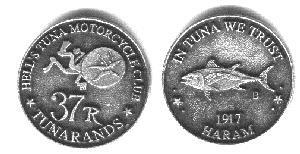 The 37 Tunarand piece is the only unit of Tuna currency. It's value has recently been set to US $3.37 per 37 Tunarands, or 9.108108108108... cents per Tunarand. However, it's value, like most things in the Tunaverse, varies widely. 37 Tunarand pieces have recently been traded for pitchers of beer. Until recently, mintings were struck in sterling lead, using a sledge hammer. Recent coins are poured leadless pewter. 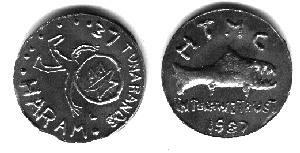 This degradation in materials is due to the effects of inflation, since the value of the lead in the old coins had become greater than their face value. Another defect of the newer coins is their inappropriately professional quality.